Over Christmas 2015 i finally finished re-painting and re-assembly of my 3m dish. I managed to get about 6 minutes of good decode from the 2395MHz DVBS downlink from an 11minute pass, which is probably not bad considering i'm at 54deg north and ISS passes are fairly low elevation for me in comparison with the overhead pass in southern UK. The ISS signal is not seen until it is above 15deg elevation when coming from the west, this is due to obstructions of the antenna by other parts of the space station.. i also see the same out to the east but it is dependant on the pass elevation. When the ISS is south of me there is a superb signal! After getting bored with the blank video from the ISS(!) i decided to get the 23cm feed back on the dish and play EME. With the 23cm VE4MA feed fitted and some Rx tests done i found the system to be working better than it had done in the past, i have no idea why this is but i'm happy anyway... maybe my measurement technique has changed somehow?! Sun/Cold Sky difference of just over 13dB. VK3UM EME Calculator suggested 13.4dB. The best i have managed in the past was 11.4dB. 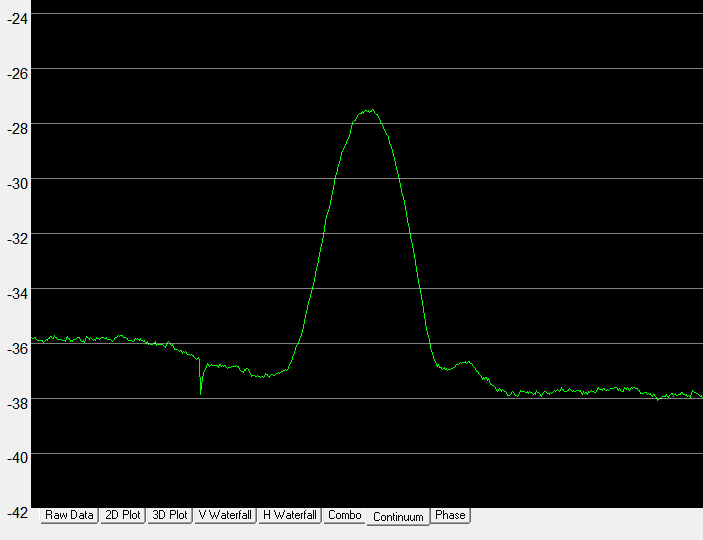 Note the sun is ony at 15deg elevation so maybe some ground noise is enhancing the result somewhat..? Cold Sky to ground noise is about 5dB, but this is such a variable test compated to SUN noise depending on what you point the dish at! My results from poiting at thick trees/bushes do not give anywhere near 5dB, the nearby sheds appear to radiate much more noise. 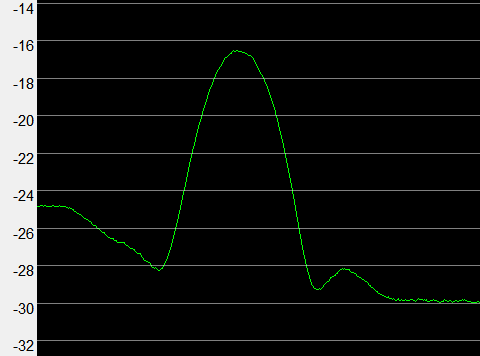 Here is a noise level plot from 0-20deg elevation. On 13cm with the square septum feed, no choke ring and Kuhne 13cm ATV down converter it is not as good, some 4dB to find here when i get around to it.. I'm using SDR# with the airspy Rx on USB, 16KHz wide filter, No AGC and feeding this into spectravue for the continuum mode to do the plot. Moon noise: a plot will follow shortly, it is detectable but not very easily. 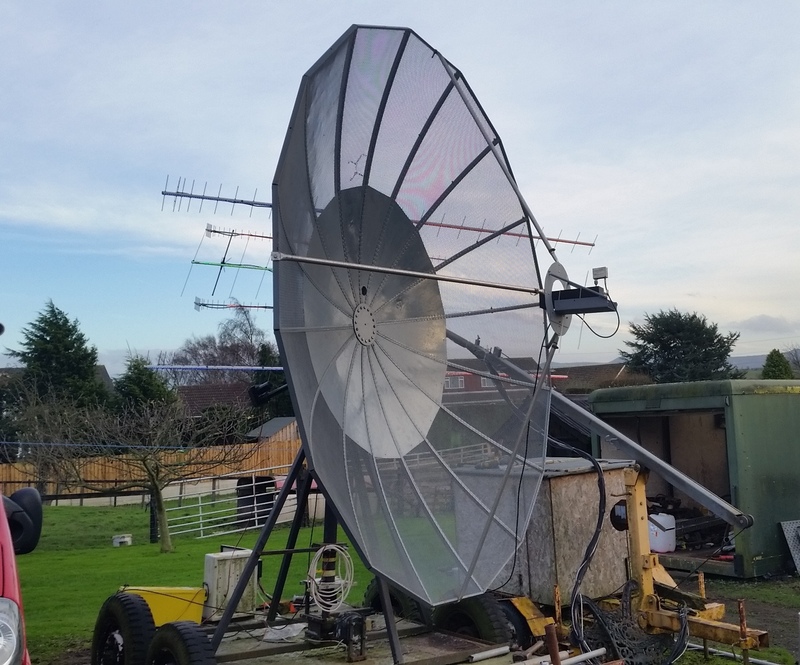 On the 17/18th Jan i had the Tx coax connected to the dish and managed a good number of QSO's via the moon. 8 stations worked on JT65 random from my CQ calls. 7 stations worked on SSB random during the SSB Funtest!